This sumptuous aerial tableau can be seen in Cecil B. DeMille’s movie, ''The Greatest Show On Earth'' (1952); onscreen, Dorothy Lamour sings its theme song, ''Lovely Luawana Lady'', whose music was composed by John Ringling North. But Pinito is nowhere to be seen: She refused to appear in the movie without a screen credit. (Yet, many circus chroniclers have stated erroneously that she had been featured in DeMille’s Oscar-winning epic.) 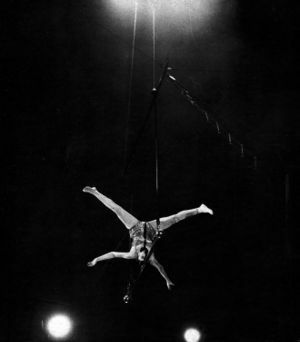 John Ringling North's 1951 production also offered a three-ring display of aerialists: Lilo Juston, [[La Norma]], and Pinito’s compatriot and close friend, [[Miss Mara]], who made her American debut that season with the Ringling show. Pinito’s contract with Ringling Bros. kept being renewed, and she continued to be a center-ring feature in lavish aerial ballets, the musical scores of which were signed by John Ringling North. In the winter, she played dates with [[Polack Bros. 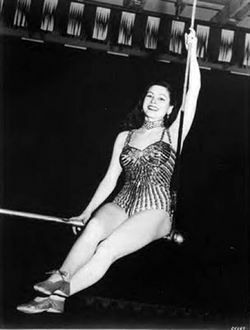 Circus]], a leading Shrine Circus producer, and for the 1952 Holiday season, she was featured in [[Tom Arnold]]’s ''Mammoth Christmas Circus'' at the [[Harringay Circus|Harringay]] Arena in London&mdash;one of Europe’s most prestigious winter circus shows. In 1955, she must have felt ''en famille'': Her niece, the very talented somersaulter on the tight wire Atilina Segura, was in the show, along with Pinito’s friend, Miss Mara, and Mara’s brother, [[Tonito]], another exceptionally brilliant tight-wire artist. Pinito’s contract with Ringling Bros. kept being renewed, and she continued to be a center-ring feature in lavish aerial ballets, the musical scores of which were signed by John Ringling North. In the winter, she played dates with [[Polack Bros. Circus]], a leading Shrine Circus producer. For the 1952 Holiday season, she was featured in [[Tom Arnold]]’s ''Mammoth Christmas Circus'' at the [[Harringay Circus|Harringay]] Arena in London&mdash;one of Europe’s most prestigious winter circus shows. In 1955, she must have felt ''en famille'': Her niece, the very talented somersaulter on the tight wire Atilina Segura, was in the show, along with Pinito’s friend, Miss Mara, and Mara’s brother, [[Tonito]], another exceptionally brilliant tight-wire artist. 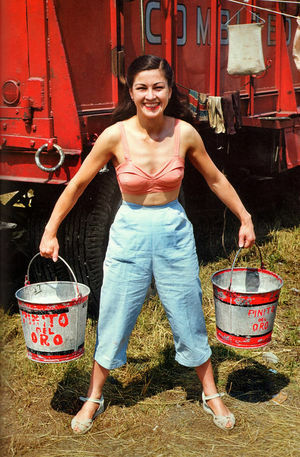 Pinito’s last appearance with ''The Greatest Show On Earth'' was in its fateful 1956 production, in which she was featured in yet another aerial extravaganza titled ''Mexicanorama''. This time, John Ringling North didn’t bother to write the music. As it was, the giant traveling circus had become unmanageable, plagued with union problems and ever-increasing operational costs. On July 16, 1956, in Pittsburgh, Pennsylvania, only three and a half months after its Madison Square Garden opening, "the Big One," as the Ringling show was known in the business, folded its tents for the last time. John Ringling North announced to the press: "The tented circus as it exists today is, in my opinion, a thing of the past." To many, this marked the end of an era&mdash;and so it was for Pinito; she returned to Spain. Pinito’s contract with Ringling Bros. kept being renewed, and she continued to be a center-ring feature in lavish aerial ballets, the musical scores of which were signed by John Ringling North. In the winter, she played dates with Polack Bros. Circus, a leading Shrine Circus producer. For the 1952 Holiday season, she was featured in Tom Arnold’s Mammoth Christmas Circus at the Harringay Arena in London—one of Europe’s most prestigious winter circus shows. In 1955, she must have felt en famille: Her niece, the very talented somersaulter on the tight wireA tight, light metallic cable, placed between two platforms not very far from the ground, on which a wire dancer perform dance steps, and acrobatic exercises such as somersaults. (Also: Low Wire) Atilina Segura, was in the show, along with Pinito’s friend, Miss Mara, and Mara’s brother, Tonito, another exceptionally brilliant tight-wire artist. Pinito del Oro had returned to her home country at the right time. 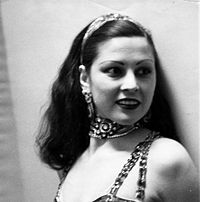 She had been invited to participate in the Gran Competición Mundial del Circo, organized in November 1956 at Barcelona’s Palacio Municipal de los Deportes (a sport arena) by Arturo Castilla, in association with Juan Carcellé and Pedro Balañá. Pinito was proclaimed "Reina del Festival" (Festival’s Queen), and many European agents and directors—a large number of whom had never seen her perform before—began to court her. Juan Carcellé had also offered Pinito a contract to work at the illustrious Circo Price, on the Plaza del Rey in Madrid, which he was managing at the time. The appearance of the beautiful and gifted American-made star on the fabled Madrilenian ring was an unmitigated triumph. 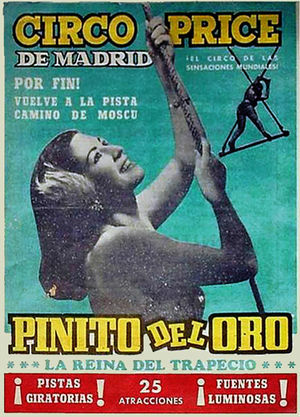 Pinito’s talent may have blossomed out of her country, but the Spanish audiences instantly reclaimed her, and Pinito del Oro became a household name in Spain. She was subsequently featured at the Coliseu dos Recreios in Lisbon, Portugal—another prestigious European venue at the time. Her European career was launched.